You are here: Home / Family & Traditions / The Romanian Blouse! The online community La Blouse Roumaine in Luxembourg is celebrating for the third time the Romanian Blouse, called IA. The festivities will take place on Wednesday 24th of June. The fun starts at 19.00 at Place Clairefontaine, with Romanian singing and folkloric dancing – and of course Romanian blouses – before moving on to a beer garden where we can get to know each other better and tell the story of IA. 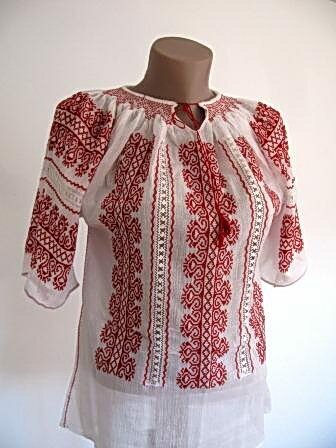 The Romanian Peasant Blouse is an important piece of Romanian folklore. Rooted in an idyllic past, Romanian women carried on the tradition of sewing peasant blouses. With manual embroidery, a blouse could take up to 3 weeks to complete. IA preserves tradition through its ornaments which highlight the differences in age, social status and life events. The structure of the Romanian blouse has remained unchanged over the centuries. In 1940, the famous French painter Henri Matisse created an important series of paintings which portrayed women in Romanian blouses. In 2013, over 24,000 people in 50 countries across six continents chose to voluntarily participate in the day of the Romanian blouse. The day of the Romanian blouse was created and is celebrated on 24th of June. If you are curious about Romanian traditions and folklore, come and celebrate IA with us in Luxembourg! To view the full program, visit our facebook event.